Rediscovering a beauty line is often like reuniting with an old friend, a mixed emotional cocktail of familiarity, excitement yet anticipation. This is exactly the way I felt about Laneige, a very popular and well established Korean skincare and beauty range promoted by megastars the likes of Lee Na-Young, Jun Ji-Hyun and Song Hye Kyo throughout the years. 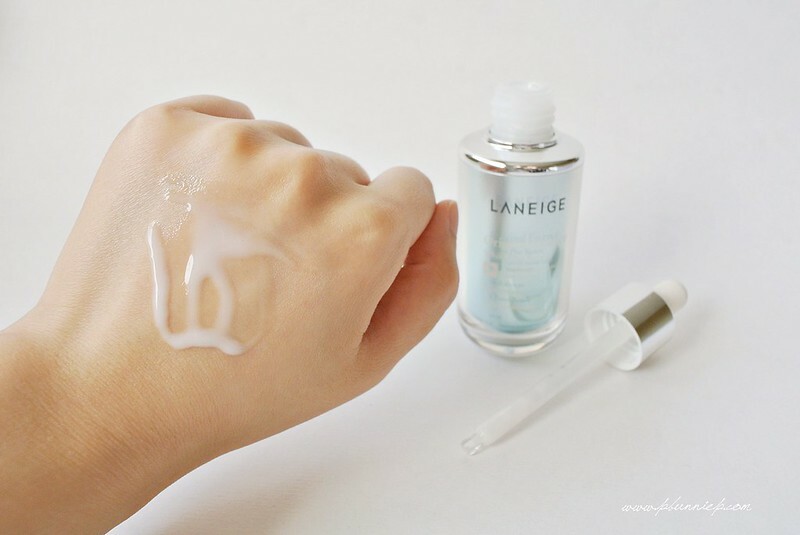 While Laneige is mainly targeted for women and men in their 20s to early 30s, I have fond memories of picking up some of my first Asian skincare products in pretty Laneige bottles in my teenage years and cradling them home like little treasures. 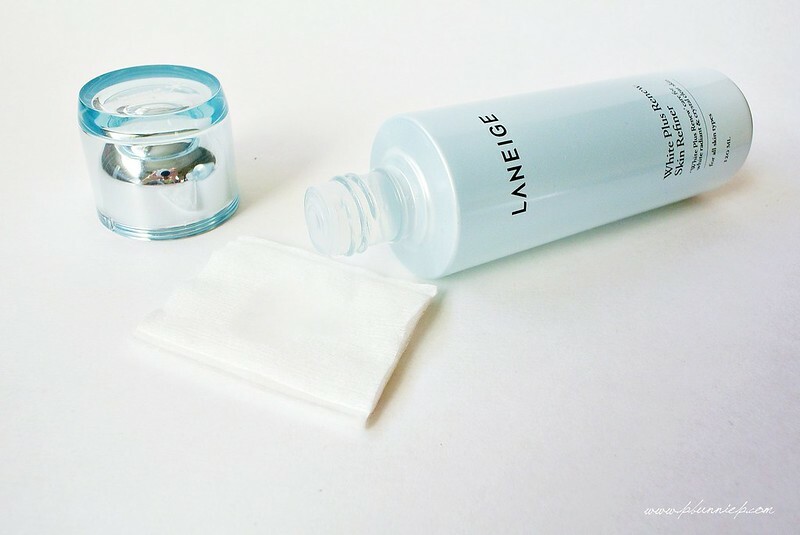 My rediscovery into Laneige occurred only a few months ago, when after a long and somewhat lonely separation, I decided to purchase a skincare set from their new White Plus Renew skincare range. This collection follows the previously popular Star White range and is new in both formulation and packaging. Housed in classic Laneige glass bottles (with the exception of the Essence which is plastic), the initial impression was fresh, bright and luxurious in an understated manner. Laneige's White Plus Renew range is mean to renew the skin and reveal a more brightened and crystal-clear complexion. Caring for common stresses such as UV rays, pollution, acne scars, spots, freckles and sunspots. The entire range is scented with a aquatic, spa like fragrance that I find pleasant but doesn't linger on the skin long. Directions: "After cleansing, take proper amount onto a cotton pad. Lightly wipe along the skin texture in the order of cheeks, forehead, nose, lip area and neck from the inside to outside. Avoid eye area." If the term Skin Refiner sound foreign, it can somewhat be considered the equivalent of a toner in Western skincare. It's main purpose here is to smooth, clarify, lightly hydrate and to prep the skin's surface to receive further treatments and products. I found this to be a nice product to use that felt refreshing and was not at all irritating although I would not consider this a crucial product to own in the range. It has a clear watery jelly like consistency which can be used with hands or on a cotton wool (as directed) although do note that because of it's texture, it can take quite a bit of product to saturate the cotton. While there was no stinging or sensitivity from this product, I do suspect there is some amount of alcohol in it but it doesn't seem to bother my skin. Directions: "After using skin refiner, take an appropriate amount (1.8cm in diameter) and lightly apply in the order of the cheeks, forehead, nose, lip area and neck from inside to outside. Avoid eye area." By order of application I would apply the Original Essence after using the Refiner, however as I purchased the Refiner and Emulsion together in a sett, I had initially solely used these two before adding the Essence to my routine later on, hence why they are being grouped together. Having purchased this in the summer time, I found the emulsion alone to be sufficient as my daily moisturizer, it has a light and refined texture that seems to form a comfortable moisture barrier on my skin but not a film. It's not so light that it evaporates into thin air but neither is it greasy or leave any residue after application, for my combination skin in the summer months I felt it was quite perfect. Those with dry to very dry skin will likely need a cream moisturizer to layer on top or add a hydrating serum. One pump to a pump and a half will spread nicely over my face and neck, it's very soothing to apply and is a very comfortable moisturizer under foundation. I have heard there is/was a SPF version of this emulsion, though I'd think this particular one without would be more skin friendly to most people. 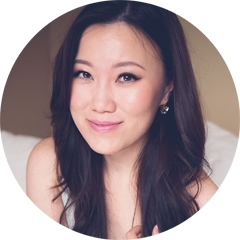 Between using the refiner and emulsion, I noticed a difference in the brightness and translucency of my skin within 2-3 weeks of consistent usage. It did improve my skin texture and brought a healthy moist glow to my face with some notable reduction in skin unevenness but no drastic changes to any spots and scarring...until I tried a sample of the Original Essence. Directions: "For the morning and evening skin care, at the essence stage, pump two times (1cm in diameter) and lightly apply in the order of cheeks, forehead, nose, lip area and neck. Lightly press the palms down onto the face for better absorption." I was completely sold on this Original Essence after using a few samples that came with my refiner/emulsion set. 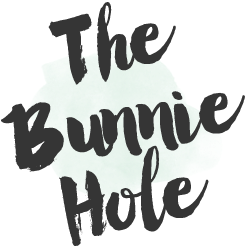 Having already started using the other two products for a few weeks, I decided to add in the essence and immediately noticed a difference in my skin tone but also the residual marks and small pigmentation scars from spots and blemishes. My samples lasted me almost a week and I ordered a full sized bottle without a second thought. The essence smells somewhat a tinge sweeter than the other products in the range but still non-irritating by my standards, in fact I do find that scent adds to the overall sensorial experience of my skincare ritual. While I was hoping for the same beautiful glass packaging, 40ml dropper bottle seems to be a chrome finish plastic, easy for travel but a little disappointing given the price. I use this mainly on a nightly basis before the emulsion or if I am also using a heavier cream moisturizer in addition to that, then it would go after the emulsion and before the cream. A little pump of 3 drop on my finger tips will pat and smooth nicely over my face but not enough for my neck. I really adore how mild and lightweight this essence is, not adding any extra burden to my skin even when layering multiple skincare products. Immediately after application, my skin feels calm, smooth and refreshed. I find that this Original Essence gives a visible boost to effects of the refiner and emulsion duo is truly a star product worth splurging on even if you are just adding it to whichever products you are currently using. 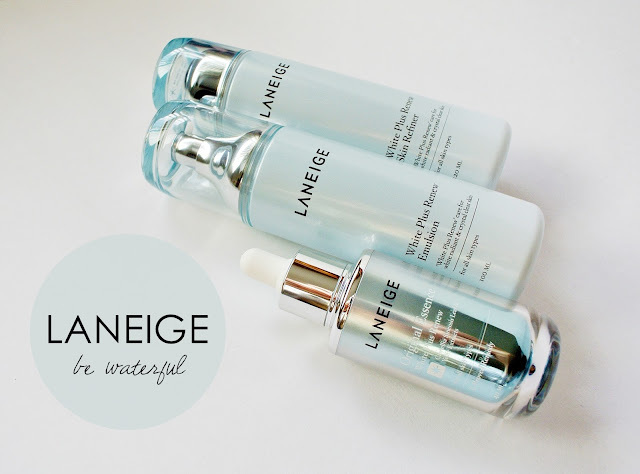 As a trio, the Laneige White Plus Renew range has thoroughly impressed me with it's refreshing textures, lighter fragrance (than it's predecessors) and beautiful results. While these products doesn't appear to significantly prevent my blemishes from surfacing, I find my spots leave less scaring and tend to heal faster which is always appreciated. 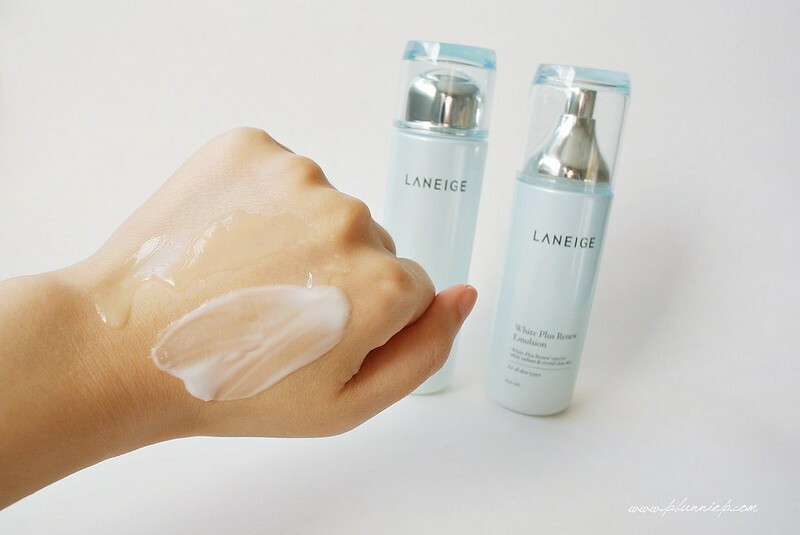 As some of you have asked me how this compares to the Hadalabo Shirojyun range, I would say Laneige has a more refined texture and gives a more luxurious user experience and is also more suitable for combination to dry skin while the Hadalabo is much simpler (in ingredients), unscented and provides deeper and more intensive hydration. Both are great performing products in my opinion. 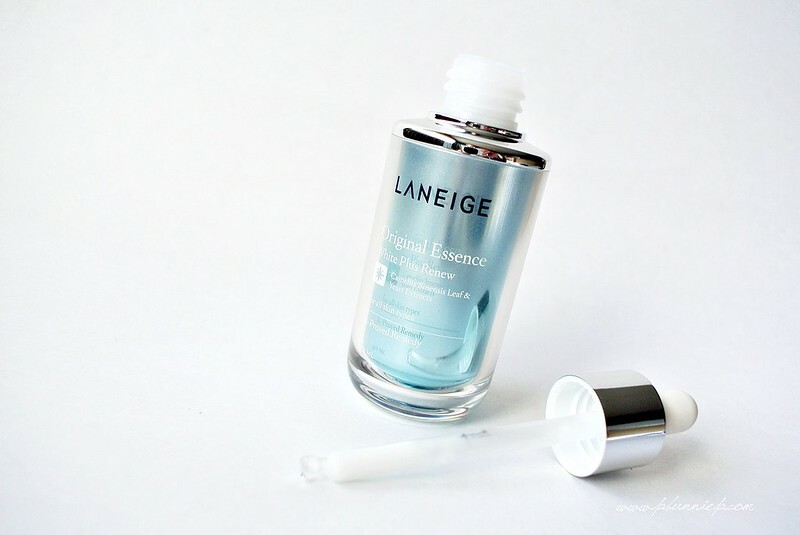 Last note: While I didn't personally experience any breakouts or adverse reactions with the Laneige range, I do know some people break out terribly with the line overall. 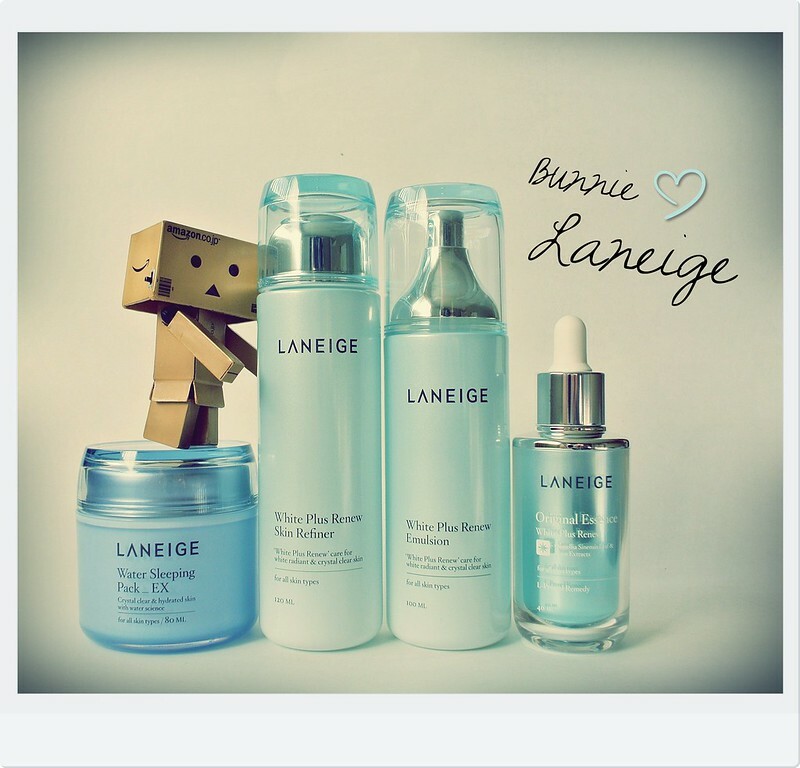 Laneige products are not always oil free either so be sure to look up the specifics of each item if that is a concern. 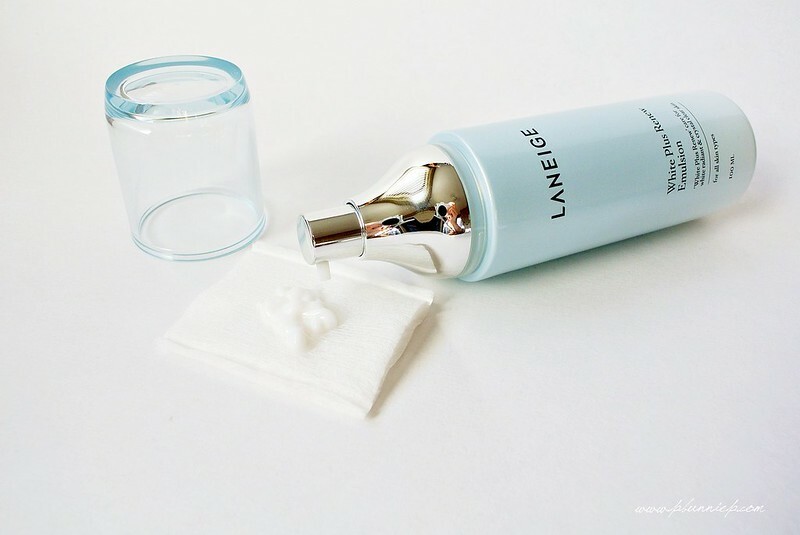 On a brighter note, try the Laneige sensitive skin line if the other products in the range are giving your problems, I have heard good words on that one. seven months later, i was 30. is this line still great for me? There's no reason why you can't use it, it's a pretty basic line. As long as you're not looking for any extra anti-aging or super moisturizing properties, it should be fine.